EASTON, Pa. (CNS) — A visitor attending Mass at St. Jane Frances de Chantal Church might not notice anything unusual about the celebrant. Father Bernard J. Ezaki walks the center aisle of the massive church in Easton. He climbs the steps leading to the altar like any other priest or liturgical minister. He recites prayers with the normal vigor and rhythm of a cleric. People might notice Father Ezaki doesn’t use the Roman Missal to read the prayers, or that the priest holds a micro-cassette in his left hand, and that technology contains all the Mass prayers and readings. Father Ezaki is like any priest except that he is legally blind and has been that way since birth. 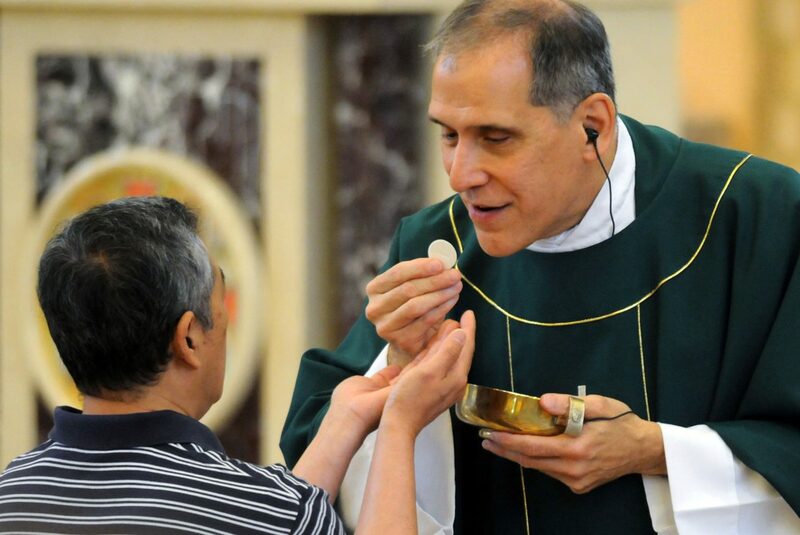 Next year, Father Ezaki will celebrate the 30th anniversary of his ordination as a priest in the Diocese of Allentown, which encompasses five counties in eastern Pennsylvania. He was ordained after studies at St. Charles Borromeo Seminary in Wynnewood. Father Ezaki’s blindness resulted from being given too much oxygen following his premature birth. That led to “retinopathy of prematurity,” an eye disorder affecting premature infants that leads to lifelong vision impairment and blindness. The lack of vision has never slowed him down. The idea of a religious vocation first occurred to him as a child. He told his parents, the late Dr. Toshio and Mary Ezaki, he wanted to become a priest because he thought they worked only on Sundays. In high school and college, he says, he began seriously considering the priesthood. Father Ezaki attended Allentown public schools and earned bachelor’s and master’s degrees, including a master’s in theological studies from Harvard Divinity School in Cambridge, Massachusetts, before studying for the priesthood at St. Charles Seminary. As a student, Father Ezaki used recorded textbooks, took careful notes of what he heard in class and always found people willing to read to him. Father Ezaki said he learned how to record the prayers and readings of the Mass from another priest who became blind after ordination. He said he prepares the liturgy with a magnifying glass and tape recorder. 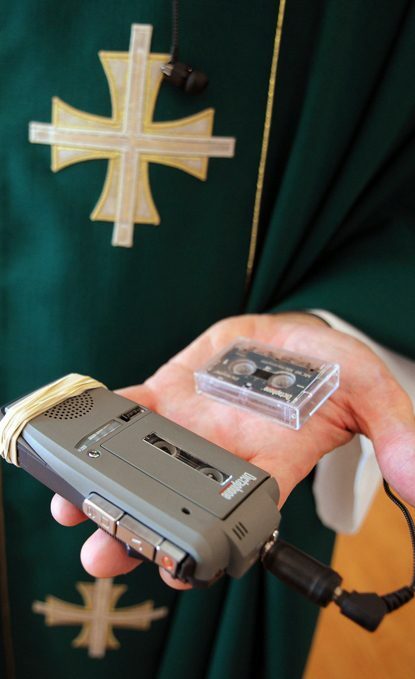 A wire from the tape cassette runs under his chasuble, with an earpiece in his left ear enabling him to listen to the words. “If I want to stop it to tell a joke, I just stop it,” he said. Father Ezaki began his first year in parish ministry as an assistant pastor. He then taught theology to sophomores at Bethlehem Catholic High School in Bethlehem until 2013, when then-Allentown Bishop John O. Barres, now bishop of the Diocese of Rockville Centre in New York, asked him how long he had been teaching. He came to St. Jane Parish last October after serving as an assistant pastor at the Cathedral of St. Catharine of Siena in Allentown. Despite his blindness and other setbacks, Father Ezaki never shows bitterness, according to those who know him. He is known, however, for sprinkling humor into his homilies, writings or everyday conversations, with much of it self-deprecating. He sometimes editorializes, too. At the end of Mass July 2, Father Ezaki mentioned the pride swelling from St. Jane’s parishioners with the news that a native of their parish, Bishop-designate Alfred A. Schlert, was named June 27 by Pope Francis to become the diocese’s fifth bishop, succeeding Bishop Barres. “We priests are very enthusiastic,” Father Ezaki said. “The good thing is that he knows us, and we know him. The bad thing is we know him and he knows us.” That elicited first laughter, then applause, from the congregation. Father Ezaki proclaimed, “Let’s belt this one out,” as the organist played “America the Beautiful,” the recessional hymn for the Sunday before the Independence Day holiday. Father Ezaki also works on a blog called Apology Analogy. His writings use visual imageries — analogies — in defense of the Catholic faith. He is not afraid to express his Catholic faith either in his writings or his preaching. God bless you, Father Ezaki, we miss you terribly at the Cathedral! .Congrats and God bless you Father. We need you!